The Shattered Star eXiles guild on Outland is now up and running again. The aim for this guild is to be a guild of players who are initially low to middle level, who may be new or returning for the expansion. Who wish to have fun whilst leveling/grinding and who could help each other out in the process. -Cross-Server Battlegrounds: For the first time in the history of World of Warcraft, you will be able to face off against players from other realms in the Battlegrounds. PvP Battlegrounds link Alterac Valley, Warsong Gulch, and Arathi Basin so that players from several realms will be combined into one huge matchmaking pool. 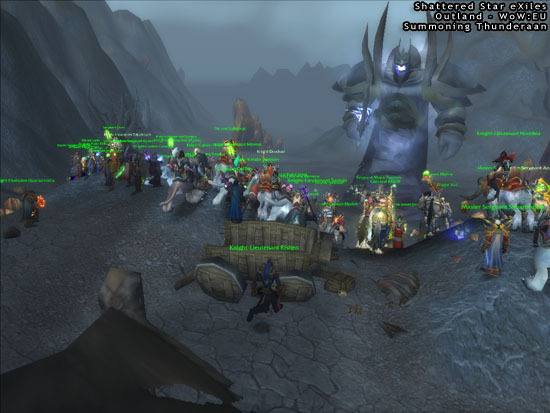 -World PvP: The stage is set for intense, objective-based land battles as Horde and Alliance vie for control over important strategic positions and resources around Azeroth. Head out for Silithus and Eastern Plaguelands to engage the enemy on the field. For a complete list of patch notes click here. For a list of patch mirrors click here. This sunday 09/07/06 Will be an organised guild day in sithilus. We will be completing as many sithilus quests as possible. If you have nothing better to do, or would just like to help I'd like to see you there. Anybody with quests to finish and things to summon should meet up in cenarion hold by 12 midday BST. We will organise sorties out to finish the quests and gather materials to summon the smaller and if we have enough people, larger bosses at the camps. We will be using vent, so treat this like an outdoor raid. Patch 1.11 Goes Live Tomorrow! The latest World of Warcraft content patch 1.11 will go live on the European servers tomorrow morning! SSX defeat the Twin Emperors! After being on only the second night of attempts, yesterday evening the SSX on Outland defeated the Twin Emperors in the Temple of Ahn'Qiraj! Only C'Thun is left to defeat (minus the optional bosses) who is the final boss in AQ40 and also the hardest boss currently ingame. The day many have feared for years has finally come: the Scourge has launched a direct attack on the lands of Azeroth! Reports of necropolis sightings are coming in from all over the world, the massive structures looming ominously on the horizon, ready to move at Kel'Thuzad's command. A dreadful dawn is rising in the east as the Lich King's dark minions prepare to descend upon Azeroth. Soon the Scourge will march again, and this time there is no prophet to speak the warning, no gallant knight to fight the coming darkness, no legendary hero to thwart the monstrosity on the Frozen Throne. It is up to you now to become the fire that burns against the cold, the light of hope that prevails beneath the shadow of the necropolis! -To learn more about this upcoming event see the new Invasion of the Scourge page! The Insider recently interviewed the World of Warcraft designers about Thaddius, one of their latest monstrosities (er, creations). This twisted, Frankenstein-like boss haunts the halls of the new dungeon Naxxrammas - introduced in upcoming Patch 1.11. Read on to find out how Thaddius was created -> Click Here. Draenei revealed as the new alliance race at E3! With the opening of E3 in Los Angeles today, several new pieces of information about the up-coming World of Warcraft expansion, The Burning Crusade, have been revealed. First among them are the details about the new Alliance race: the Draenei. The Draenei, also known as the "exiled ones," have joined the Alliance. You can learn more about this mysterious race by reading the Burning Crusade FAQ. Blizzard have also posted a new gameplay trailer, new screenshots, new artwork, and several new wallpapers, all featuring the Draenei. Along with the information about the draenei, they have posted the history of the blood elves. Last, but not least, Blizzard have published a new gameplay trailer featuring content from Naxxramas, a new raid dungeon coming in the next content patch: Shadow of the Necropolis. You can see some of the other changes coming up by checking the Under Development section. Blizzard Entertainment and Legendary Pictures today announced that they will develop a live-action film set in the Warcraft universe. Legendary Pictures has acquired the movie rights for the game universe, and both companies are now focused on translating the Warcraft experience to the big screen. 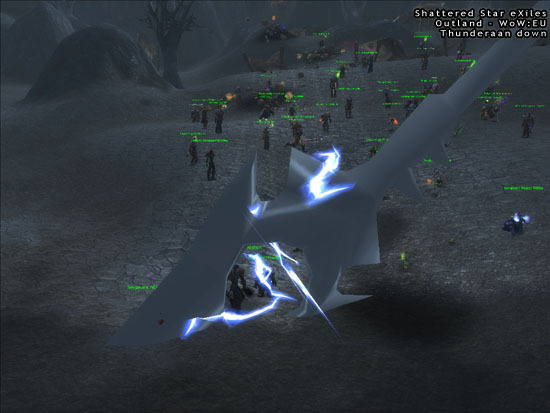 Less than 24hours after the previous news post was made and all 100 arcanite bars have been gathered and we have summoned and defeated Thunderaan - The Prince of Air. SSX-Avator is now the proud owner of the second legendary weapon in the SSX, and one of a very very small handful of people on the entire server to own one, lets say about approx 1 of 5 people in around 12+ thousand.. You get the picture :p - "Thunderfury, Blessed Blade of the Windseeker!" -SSX-Avator receives his legendary weapon. 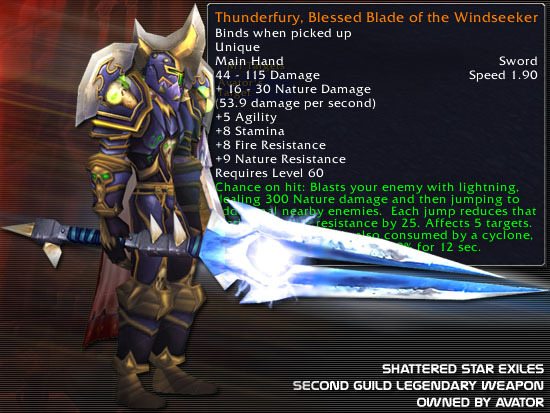 - Thunderfury, Blessed Blade of the Windseeker!